– Pure, natural and organic! Astragalus is a species of small shrub like plants and herbs which are related to legumes. Astragalus root has been used in traditional Chinese medicine for a vast number of years, and has recently caught the attention of the scientific community because of a unique group of saponins which have been identified in the root called astragalosides. Research on these astragalosides has shown that it can up-regulate the activity of an enzyme called telomerase, which is responsible for the protection and repair of parts of DNA called telomeres. It has well known that as we age, these telomeres shorten, which increases risk of DNA damage, and is associated with the signs of ageing. By increasing the activity of telomerase, you can increase the amount of protection DNA has from radical damage, and reduce to rate of telomere shortening, which, in theory, can reduce the signs of ageing. In addition to acting as a telomerase activator, consumption of astragalus has been shown to improve liver and kidney function, and has been shown to support the immune system. interestingly, one of the traditional uses of astragalus is to treat foamy urine, which we know now to be a sign of damaged kidneys. 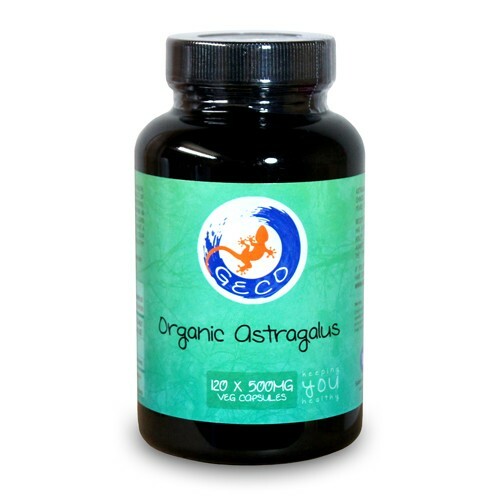 Geco Supplement’s organic astragalus supplement is nothing but pure, natural and organic. 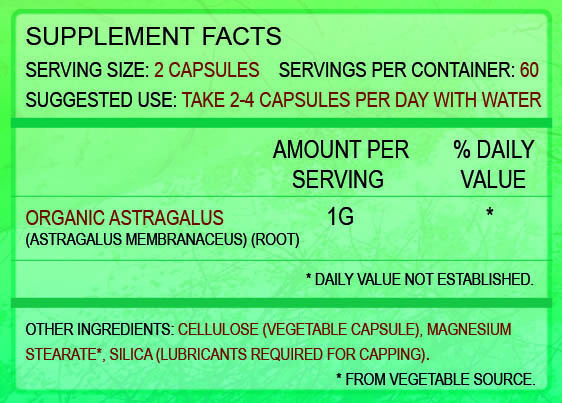 The minimal amount of processing has been used to make this astragalus supplement, to ensure that the nutrients in remain intact and undamaged. During the encapsulating process extremely small amounts of magnesium sterate and silica are used to avoid the product clumping in the machines. This is typical for all encapsulated supplements, and you can read more about these 2 compounds here.